Project Runway takes on wearable electronics « Adafruit Industries – Makers, hackers, artists, designers and engineers! 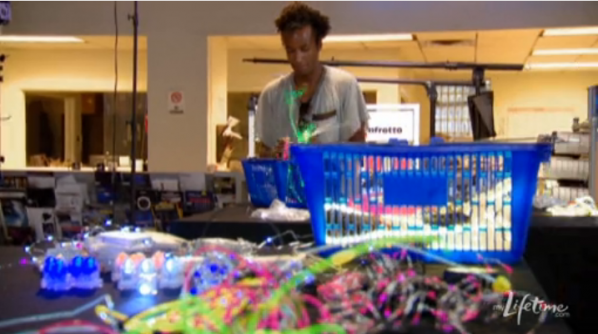 Project Runway contestants used “lighting technology” in the latest episode, taking a visit to Barbizon lighting company (mainly for film/TV) to pick out blinky magnetic LEDs, EL wire, LED strip lighting, blacklight tape, and a bevy of other potentially gaudy lighting options. I thought the contestants did an excellent job especially considering they were all quite intimidated by the idea of using electricity in their designs for the first time. I only wish the show producers would have brought them to Adafruit, where our EL wire, tape, panel, slow-fade LEDs and RGB LED tape would have looked fantastic on the runway, and our tutorials could have put the designers on the fast track to success. Maybe next time! What did you think of the challenge and results this week? Leave a note in the comments.